This post is part of a series recapping all of the wonderful gluten free and (mostly) paleo-friendly meals that I ate during my recent two-week trip to Europe, including what and where I ate. If you missed the first two parts of this series, catch up on what to eat in London here and Paris here. We bid adieu to Paris and, like the jet setters that we are were for those two weeks, hopped a plane for Istanbul. 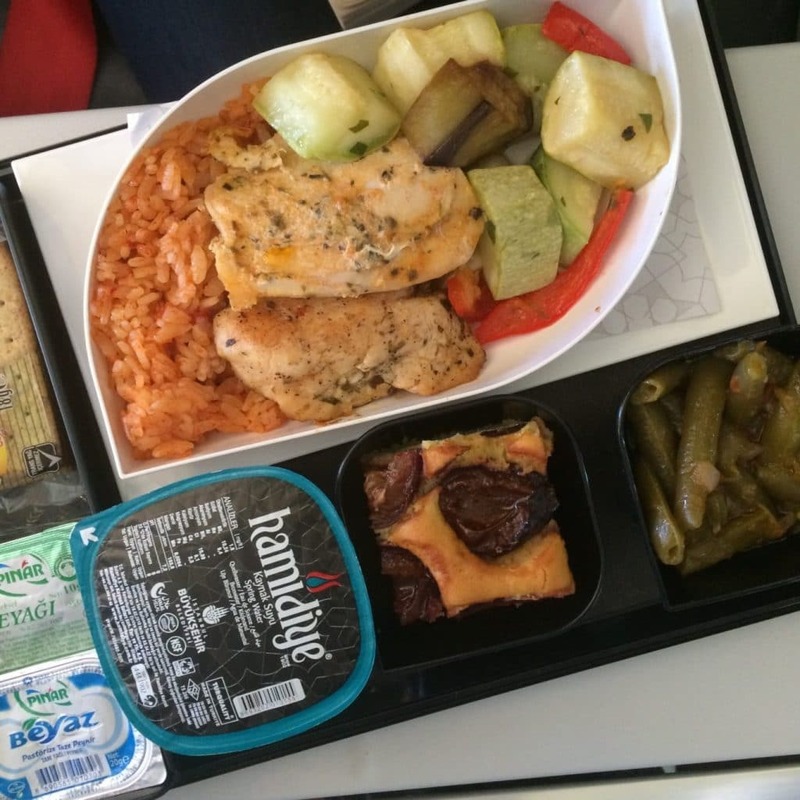 One of the best parts of flying Turkish Airlines is the food. 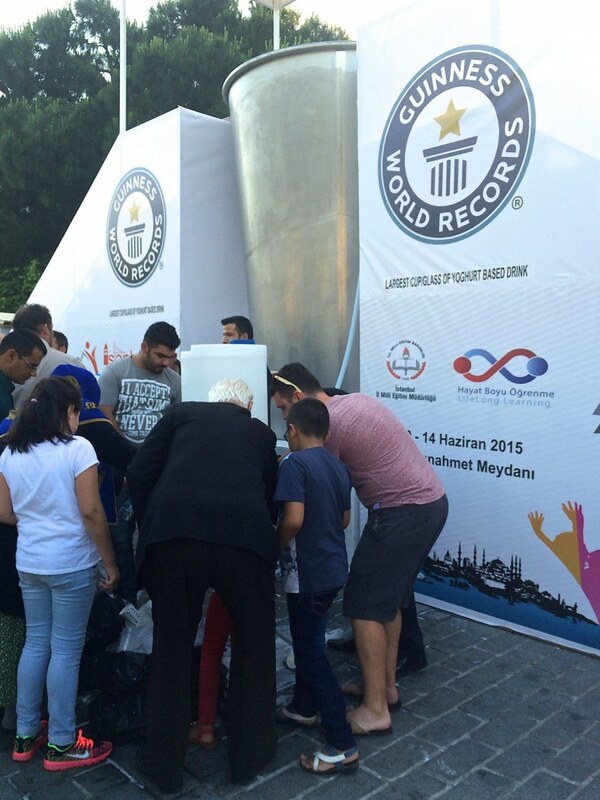 They started out the by passing out a bite of Turkish delight and a lunch menu – a menu! It’s amazing how much we miss by flying American-based airlines that have cut every corner imaginable. I selected the spiced chicken and vegetable dish for lunch, which came with rice, my favorite chilled green bean appetizer, cheese, crackers and plum cake for dessert. Except for the crackers and the plum cake, the entire thing was gluten free (and this wasn’t a special meal or anything). And it tasted fantastic! 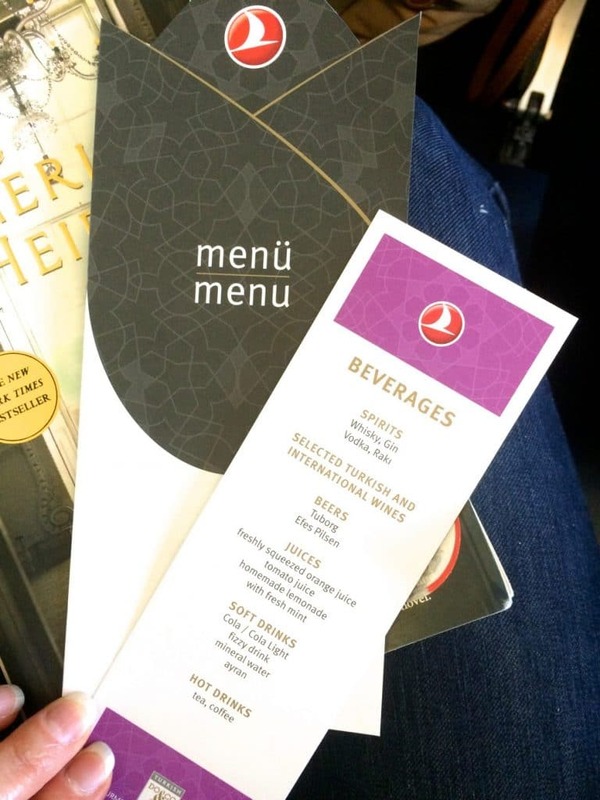 Some of the best airline food I’ve ever had has been on Turkish Air. Yes, I know that is a very low bar, but just trust me – it’s pretty good food. Our flight, unfortunately, was delayed, and combined with terrible traffic, we ended up arriving at our Air B&B apartment (<— click through this link to get $25 off of your first booking!) about 3 hours late. 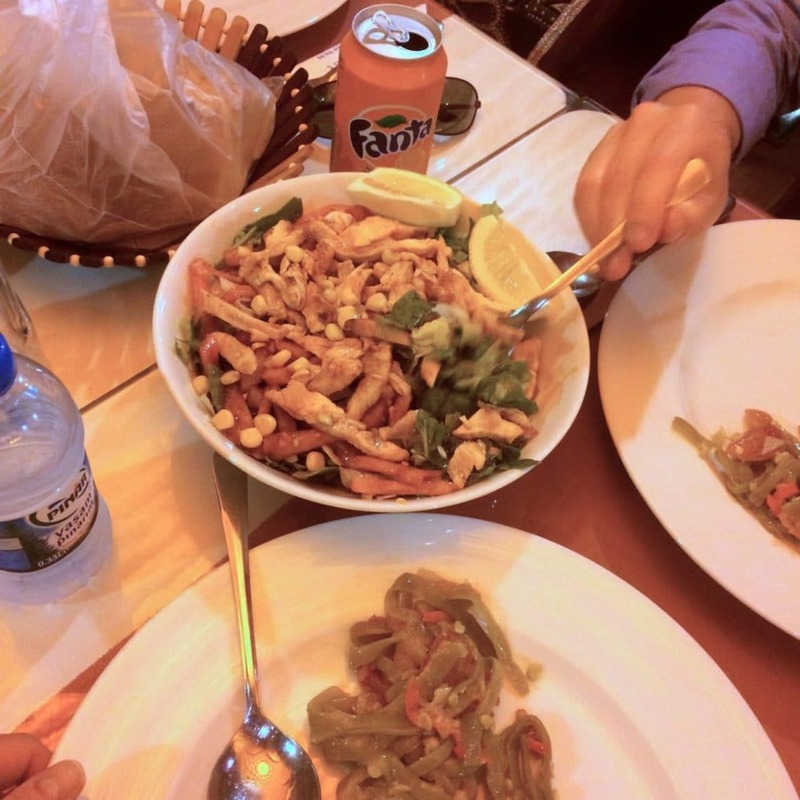 Because it was so late, we ended up going to a no-frills kebab house for a quick bite. 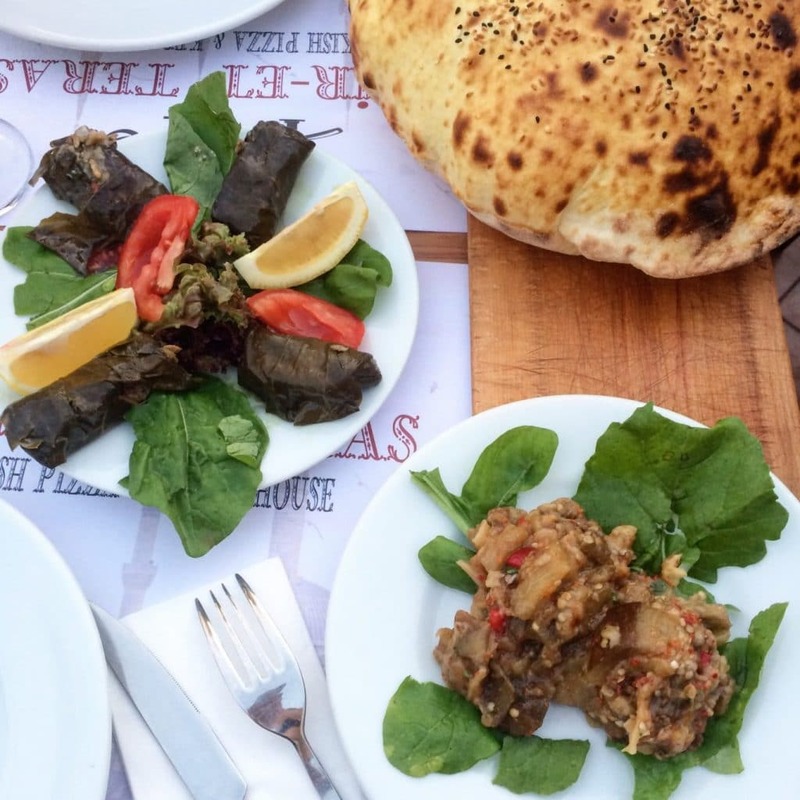 These restaurants, featuring meat on a spit served inside wraps or on platters with potatoes, rice or bulgar (wheat), and veggies are ubiquitous throughout Istanbul, and are always quick and cheap, and typically delicious. That meal was the first of the numerous times I declared that I plan to start wearing meat-on-a-spit perfume. The smell is intoxicating. Since we quite literally dropped our bags and turned around to hit the streets in search of dinner, I didn’t bring anything, including my phone or camera. So, you’re just going to have to take my word that I had a chicken shawarma plate consisting of roasted chicken shaved off of the conical hunk rotating on the spit, with fries, salad and pickles. 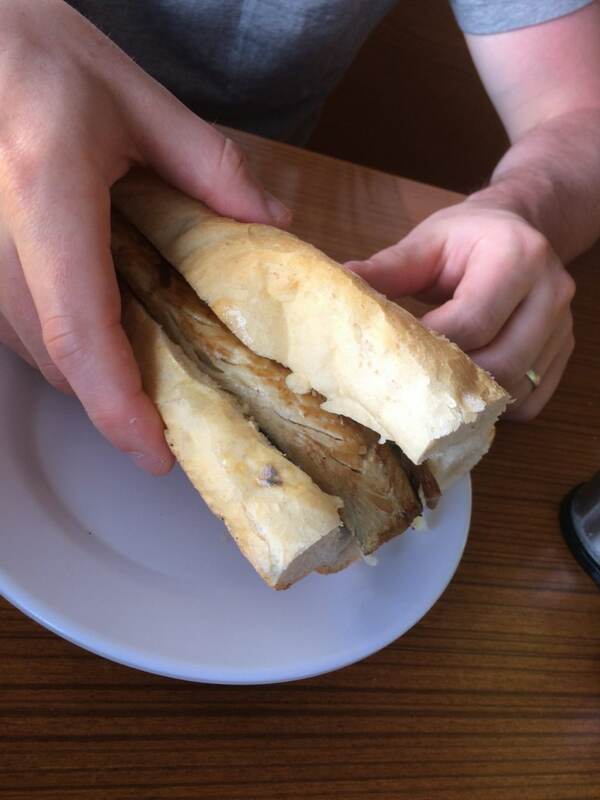 At these kinds of restaurants, everything that is available as a sandwich, pita pocket or wrap is typically also available as a platter as well. They serve bread with the platters, but it is easy to put it aside. For dessert, we had a macaron left over from Pierre Herme. We really savored those things and made them last nearly throughout the rest of the trip. I woke up first and slowly meandered into the kitchen/living area to take in the view. 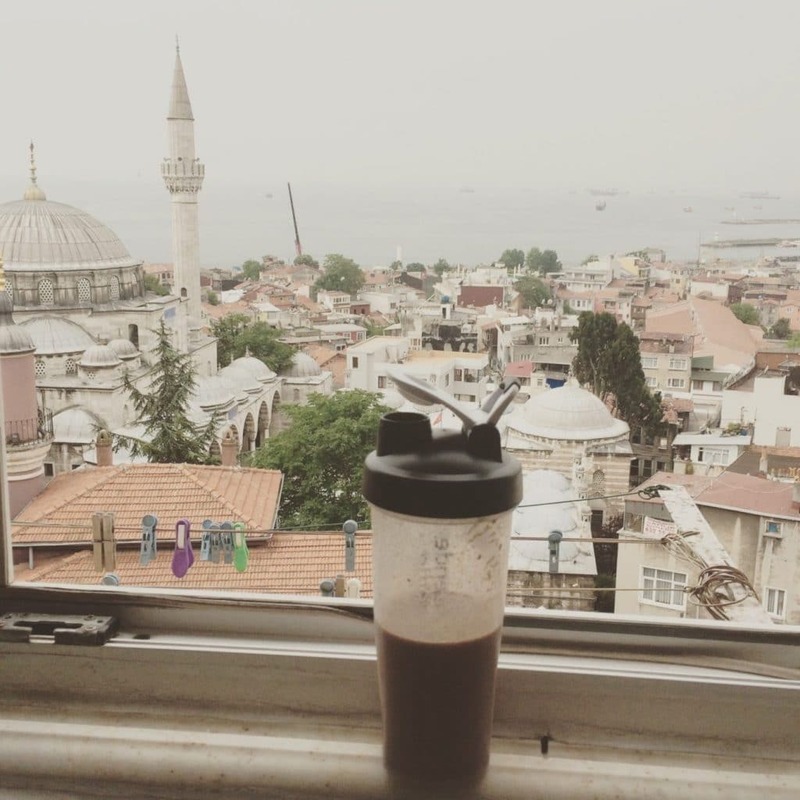 I could have sat there gazing out of the window all day every day, but I settled for drinking my protein shake that I made with water, almond butter and chocolate protein powder that I’d packed. It was terribly gritty, but I managed to choke it down while distracting myself with this view and making a mental note to stop at the grocery store to get breakfast ingredients for the rest of our time there. We left the apartment and wandered around the Sultanahmet neighborhood, avoiding the masses of Spanish tourists streaming off of their giant buses by scrapping our plans for going to the Hagia Sophia and instead ducked into the Basilica Cistern where it was dark, cool and less crowded than basically everything above ground. We scurried around, trying to keep our excitement about being in the setting of the climactic scene of Inferno, and attempting to take long-exposure photos that mostly didn’t work. All of that scurrying (and a lack of dispersion of the crowds everywhere else) really put us in the mood for lunch, so we wandered off of the main drag onto a side street for a quiet, comfortable lunch of kebabs (meat and vegetables grilled on a stick) at Sultan Saray Cafe. The place gets mediocre reviews on TripAdvisor, but I thought the food was very good and the waiter was very nice, if a little bit forward (kind of benignly hitting on me right in front of my husband). After lunch, we did some more sightseeing before it was off to the bazaars. First the Grand Bazaar, then (my personal favorite), the Spice Bazaar, where we bought a smattering of snacks: baklava (not gluten-free, sadly, so I just watched Bryan eat it and salivated), my favorite candy (no clue what the name is), mixed nuts, and dried fruit, as well as a ton of spices to bring home. 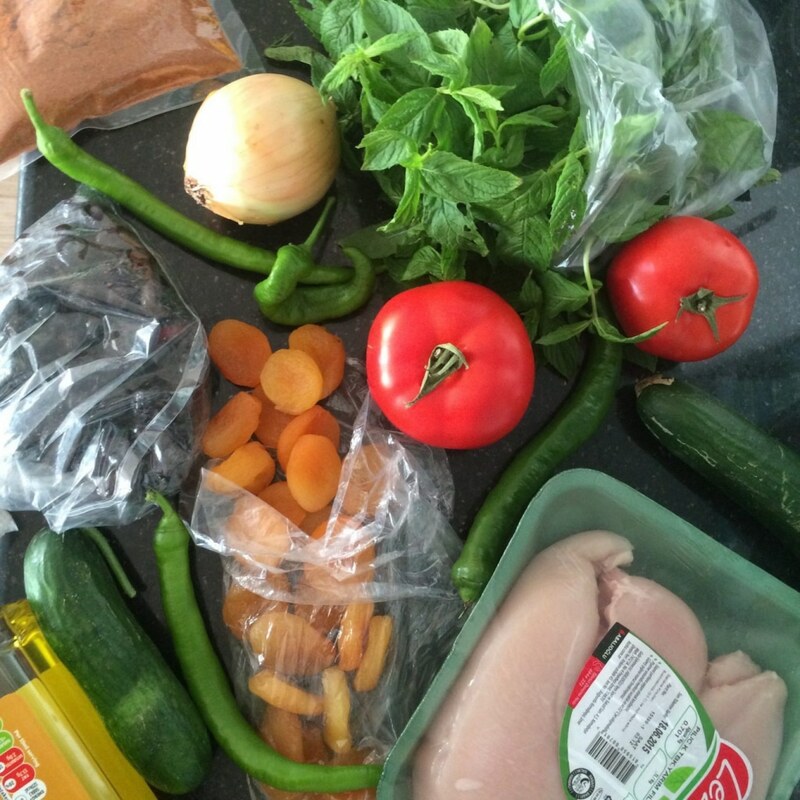 We also got a few things at the market (there are actual food stalls outside) for dinner, including olives and some produce, because we planned to cook at home. We stopped by the little neighborhood grocery store near our apartment, too, and got chicken, and some more produce from which I made a quick and easy dinner of chicken with apricots and olives (using this recipe, but replaced the turmeric and other spices with a chicken spice mix I got at the spice bazaar) that we ate with tomatoes, cucumbers, more olives, wine and sparkling water, while we admired the view. Oh, and we also had fresh Ayran (a yogurt based drink similar to Indian lassi) to accompany dinner, since the city had earlier produced the Guinness World Record’s “Largest Cup/Glass of Yogurt Based Drink” (no joke) and then, rather than letting it all go to waste, they put vats and vats of it out in the public square for the neighborhood to drink and take home. I woke up and made scrambled eggs, which we ate with veggies and olives left over from dinner the night before. 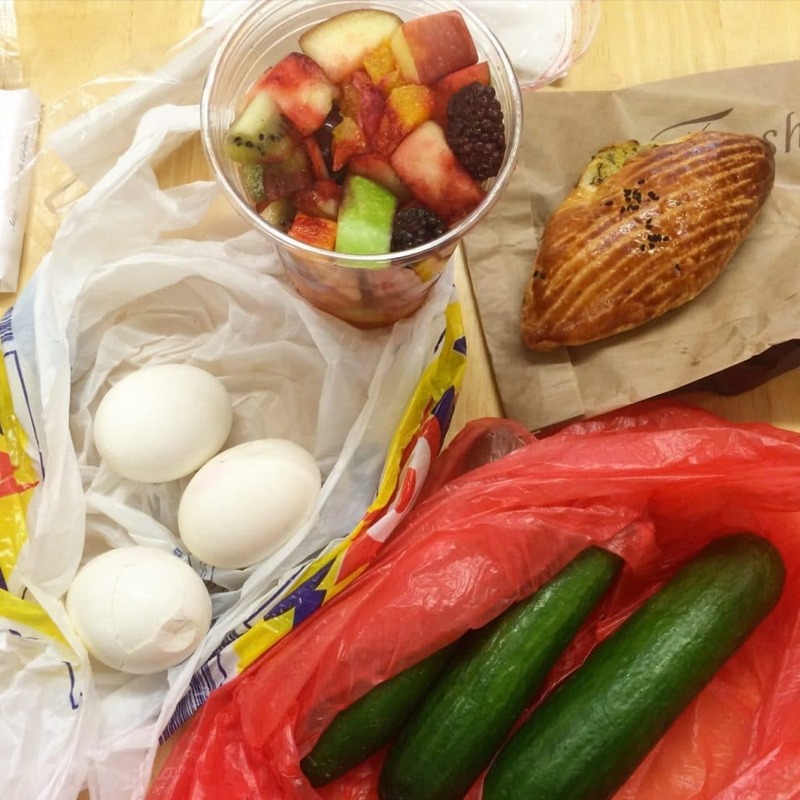 You’re probably beginning to see a pattern with our breakfasts. Eggs turned out to be the perfect breakfast, and we had them almost every day we were in the apartments in each city. Most European supermarkets sell half-dozen boxes of eggs, so we didn’t have to buy more than we were going to use, and I also bought a small bottle of olive oil on our first day in London, which I used to cook with throughout the rest of the trip. As for what to have with the eggs, that varied by city, but was usually produce and bread/pastry for Bryan. You don’t want to be stuck making huge elaborate breakfasts, and you certainly don’t want to have to track down all kinds of ingredients and equipment in each city, but any apartment is going to have a stove, a pan and a spatula, plus a bowl and fork to beat the eggs. 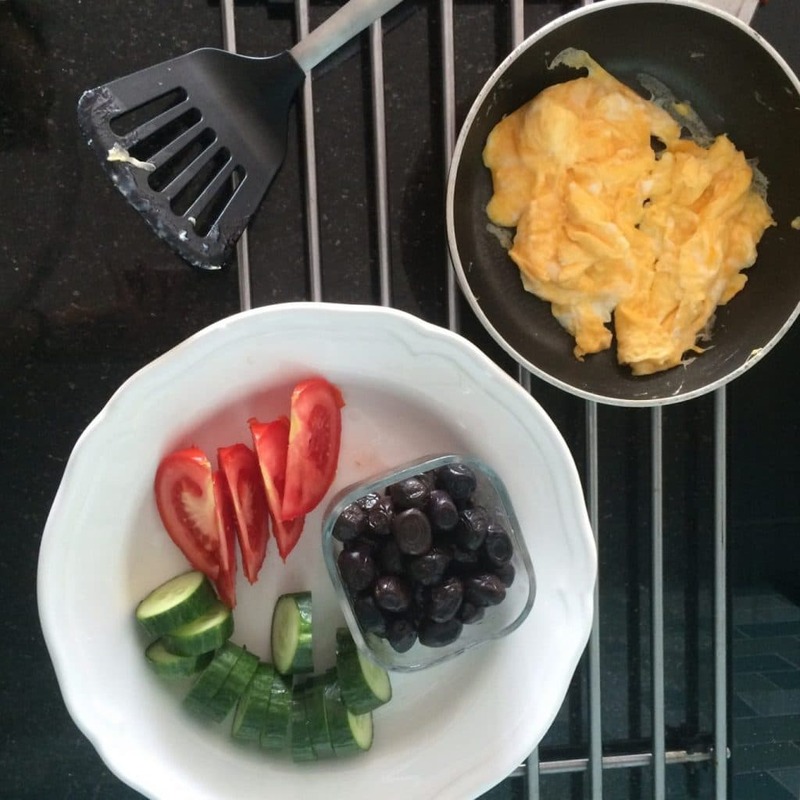 Best of all, the eggs tasted slightly different in each country, so this breakfast never got redundant or boring. After breakfast, we ventured out for a proper Turkish coffee at a sidewalk cafe on the square near our apartment. They served it with a couple bites of Turkish Delight, which I am not the biggest fan of, so Bryan ate mine. 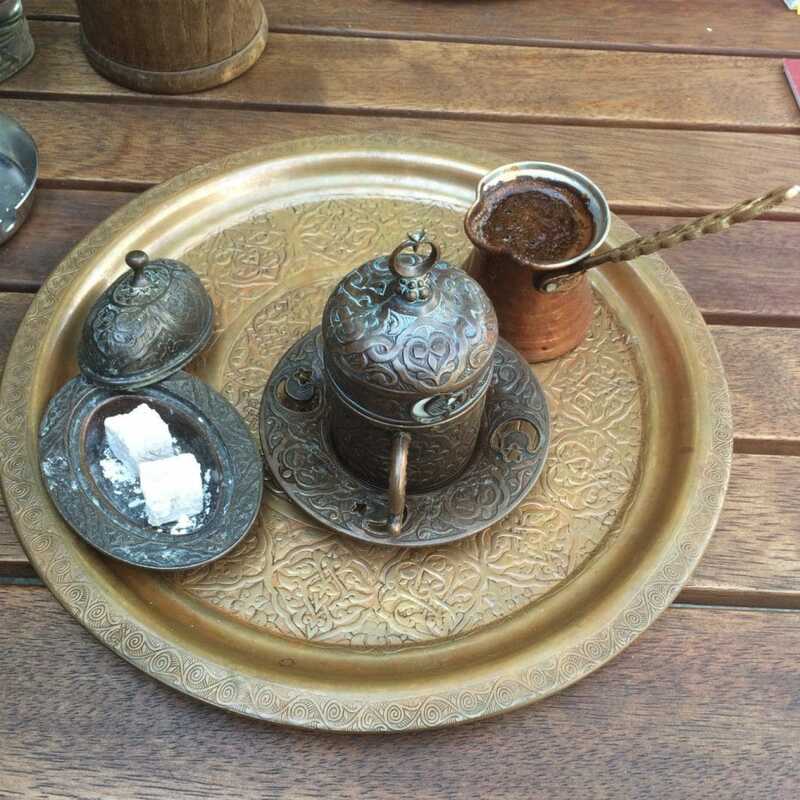 If you’re not familiar with it, Turkish coffee is made by boiling the grounds with water and warming spices until the water absorbs a deep, well-rounded flavor and the grounds sink to the bottom of the pot. Each cup is individually made in a long-handled pot and then, after you let it sit for a moment to cool off and separate (this is the part where the grounds sink to the bottom), you pour it into a slightly-larger-than-an-espresso-cup cup. So, once we had had our coffee, we were ready to hit the town. We went to the Blue Mosque, wandered around town, and ended up back at the entrance to the Grand Bazaar. Instead of doing more shopping, we ducked into a tiny take-out cafe for lunch only to discover a quiet, quaint restaurant hidden on the lower level. The menu was really extensive and I had a hard time deciding what to order! I wasn’t starving so I ended up getting a salad with chicken and an order of that delicious cold green bean appetizer that I love. 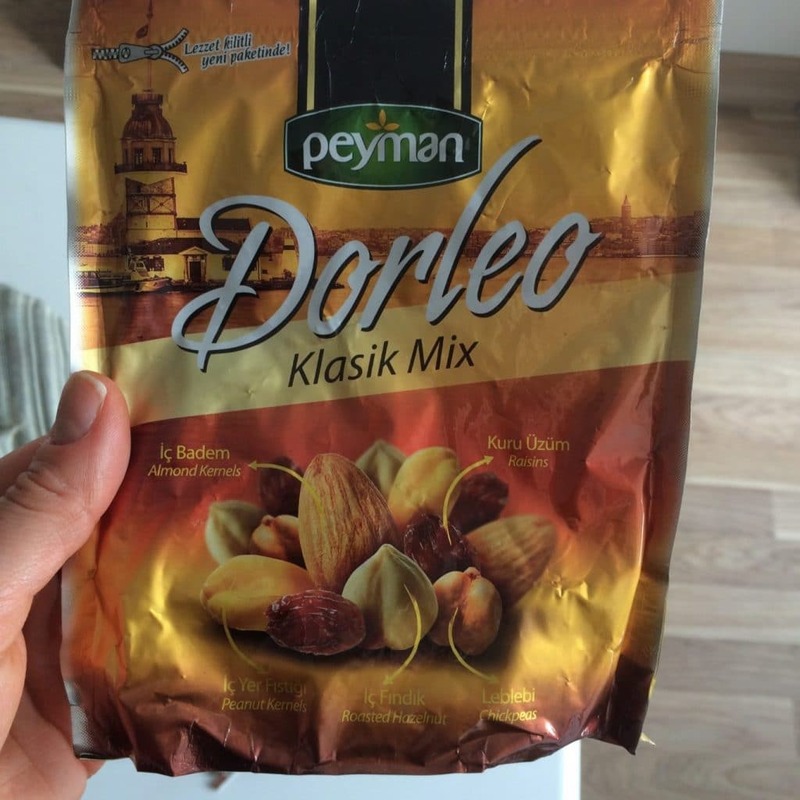 We walked around for several more hours, so I had a snack on the go: mixed nuts with raisins and dried chickpeas. 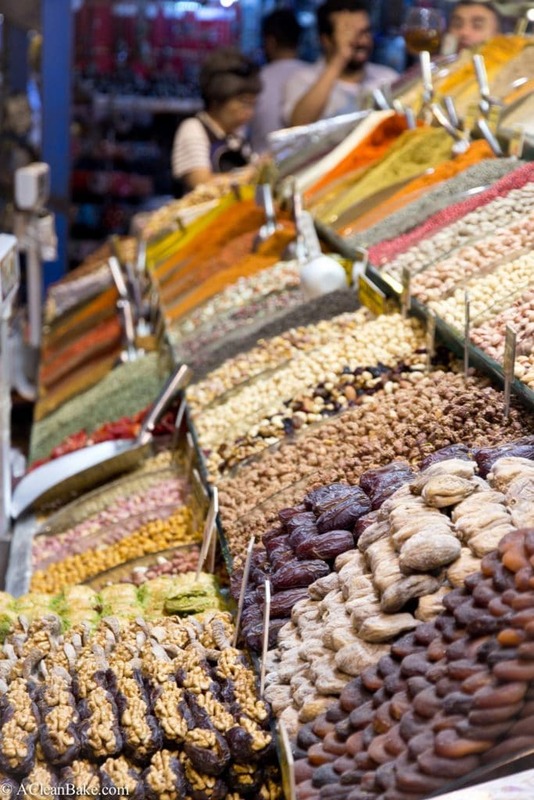 They sell variations on this theme in nearly every quickie mart and grocery store and unlike the American equivalent, the mix is mostly nuts and chickpeas, with raisins as sort of a garnish (so very low sugar), and no added preservatives or flavoring. Since we had walked around literally all day, we called it a day on the earlier side but weren’t ready for dinner, we decided to go have a drink on the rooftop cafe at a hotel near our apartment. The rolling hills of the city, temperate weather and surrounding water mean that balconies and roof decks are extremely common and most hotels and many restaurants have them. Even without a view of the water or a historical site, rooftop decks are bright, light and airy, and still give you a nice view of the city. 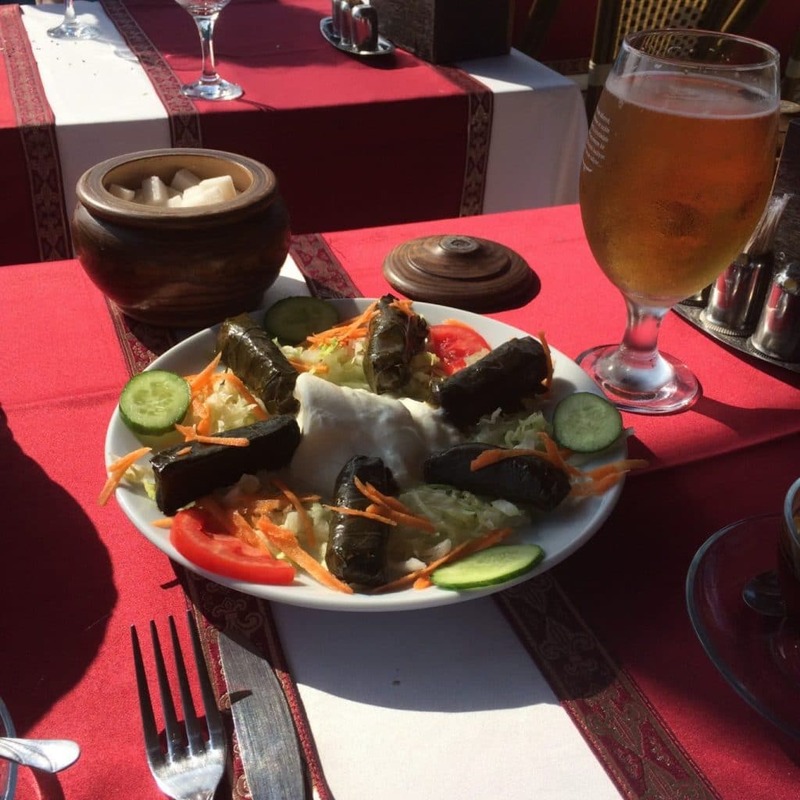 We enjoyed our view of the neighborhood and the Sea of Marmara with tea (for me), beer (for Bryan) and a plate of dolmas, or stuffed grape leaves. Then we went back to our apartment and ate dinner of leftover chicken from the night before with sautéed fresh tomatoes and spicy green peppers (with red wine vinegar, salt, olive oil and lemon), and a quick, roughly chopped Jerusalem salad. 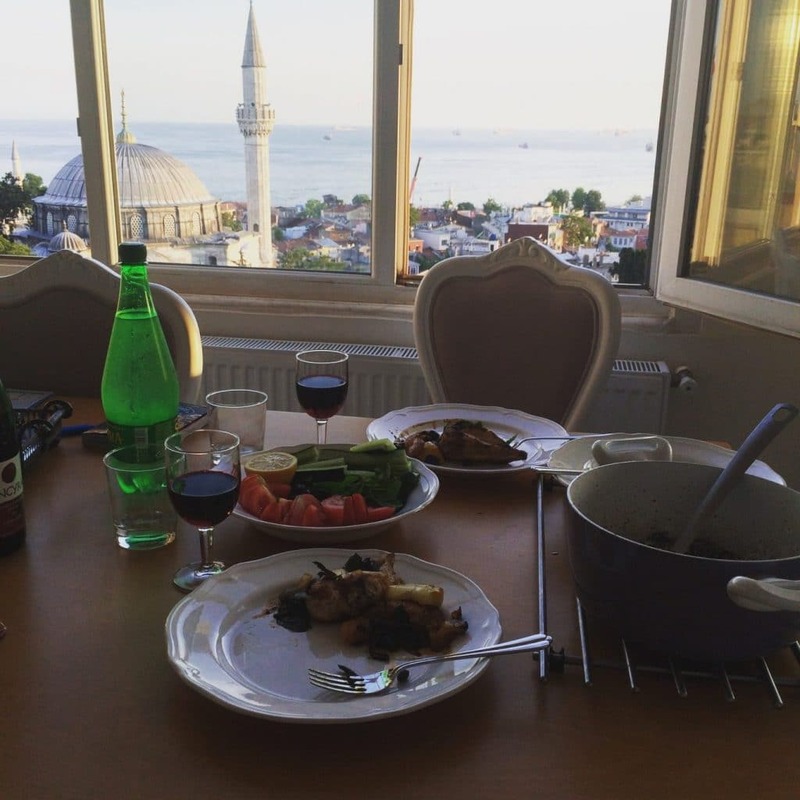 It might sound crazy to eat leftovers on vacation, but with the quality of the food in Turkey and the stunning view from the living area of the apartment, it was a really enjoyable meal. 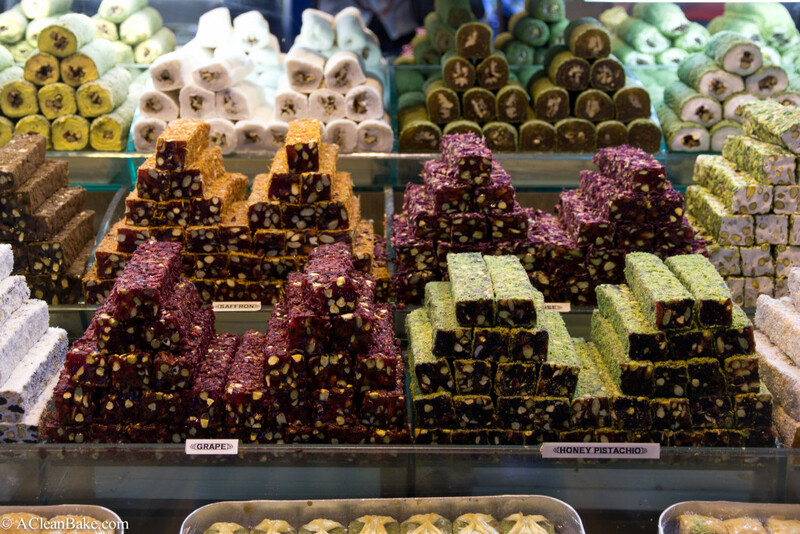 As this was our last full day in Turkey, the whole day revolved around two things: getting our hands on a real Turkish breakfast, and visiting the hammam, or Turkish bath house. 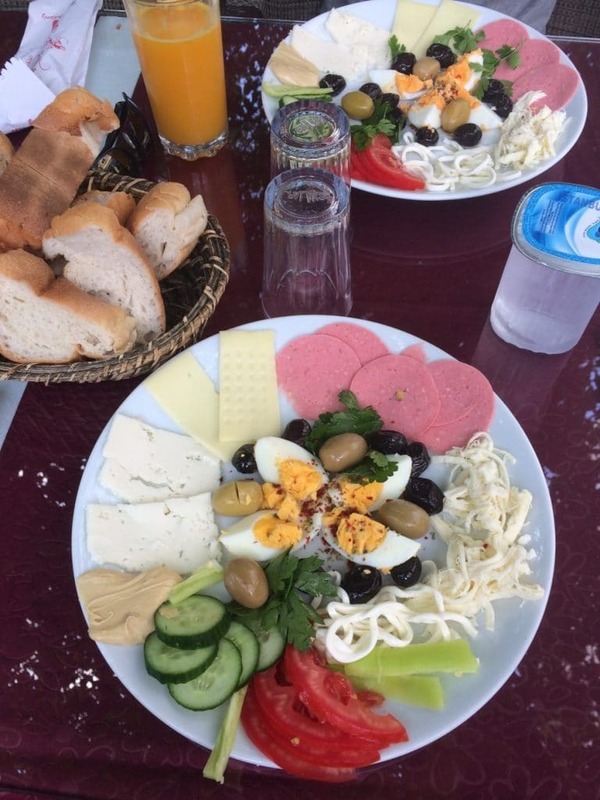 We started with a full breakfast at a restaurant on Divanyolu Cadesi, the “main drag” in the historical neighborhood of Sultanahmet, called Baran Ottoman Kitchen. It doesn’t look like much from the outside, but the breakfast was spectacular, and while we were there, they started bringing out the trays of food for the lunch counter and the smell was intoxicating. We focused on breakfast, though, and their platter included a little bit of everything: a hard boiled eggs, two kinds of olives, tomato, pepper, cucumber, four (!!) kinds of cheese, some preserved meat, and a dollop of a sweet spread that I can only describe as white chocolate Nutella. Plus, fresh bread (not for me), freshly-squeezed orange juice and hot Turkish coffee. This, incidentally, is the breakfast buffet in heaven, I think (Update: No need to wait until the afterlife for this delicious feast. You can learn how to make your own here!). After a hearty breakfast, we rolled walked north to the piers from where all of the ferries and tour boats leave, and walked along it until we got to the Galata Bridge where, on the upper level, fisherman pull their catch out of the water and on the lower level, restaurants fry up the fish fresh off of the hooks and serve it to you while it’s basically still sizzling. Last time I was in Istanbul, 10 years ago, all of the restaurants were little stalls with plastic tables and chairs outside, but this time they were nearly all flashy white tablecloth joints except for one no frills place with picnic-table-style seating on the south end of the bridge, so of course, that’s where we went to split a classic fish sandwich (it was really easy to pick out the fish and salad and leave the bread behind). 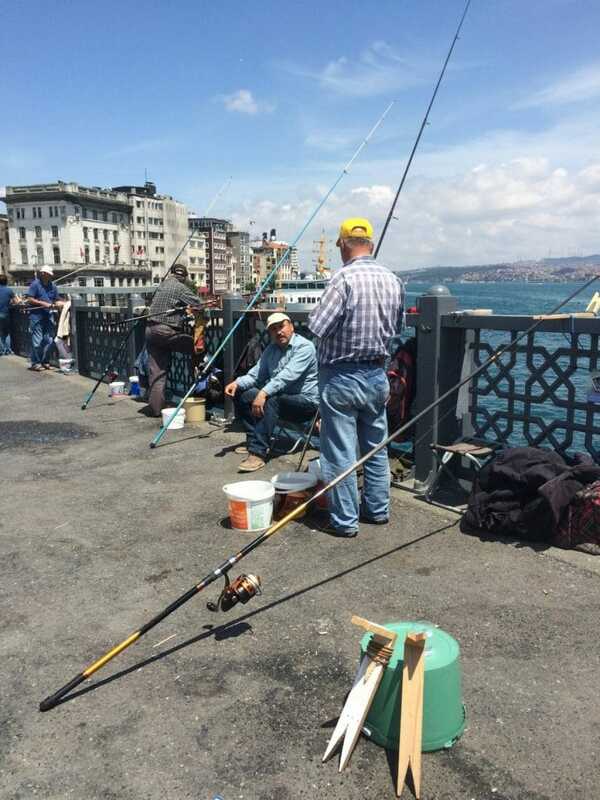 After lunch, we walked across the Galata Bridge to see the fisherman up close and had a cup of tea on the waterfront. If you’re trying to avoid refined sugar, skip the apple tea, which is so thick with sugar it tastes almost like drinking apple simple syrup. Instead, order black tea (know, however, that it’s not decaf), which is served without anything in it, and with sugar cubes on the side. We meandered back across the bridge and spent the afternoon at the hammam for a steam, scrub, massage, clay mask (for me) and straight razor shave (for Bryan). I’ve never been so relaxed and refreshed in my life. So much relaxation called for a great meal. 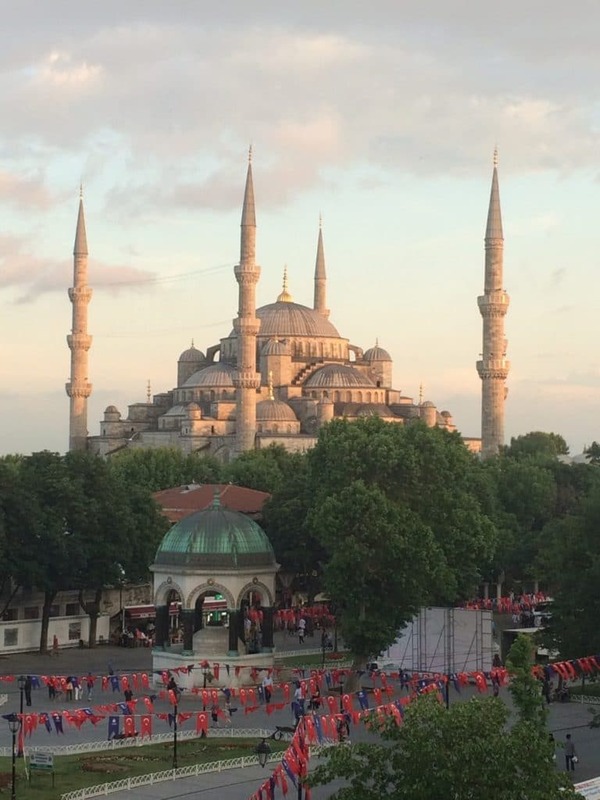 It was also our last meal in Istanbul (we were going to leave at the crack of dawn the next morning) so we made a point to do it up right at Safir-et Teras, a rooftop restaurant with a view of the sun setting over the Blue Mosque. If you have to leave Istanbul, there is no better way to say goodbye. We started the meal with stuffed grape leaves and a plate of grilled eggplant (it was sort of like a chunky, spiced version of baba ganoush). They also brought out a loaf of bread that could, in a pinch, double as a pillow if you needed it to. It was massive, puffed up with hot air, and still steaming from the oven. It was fun to poke. 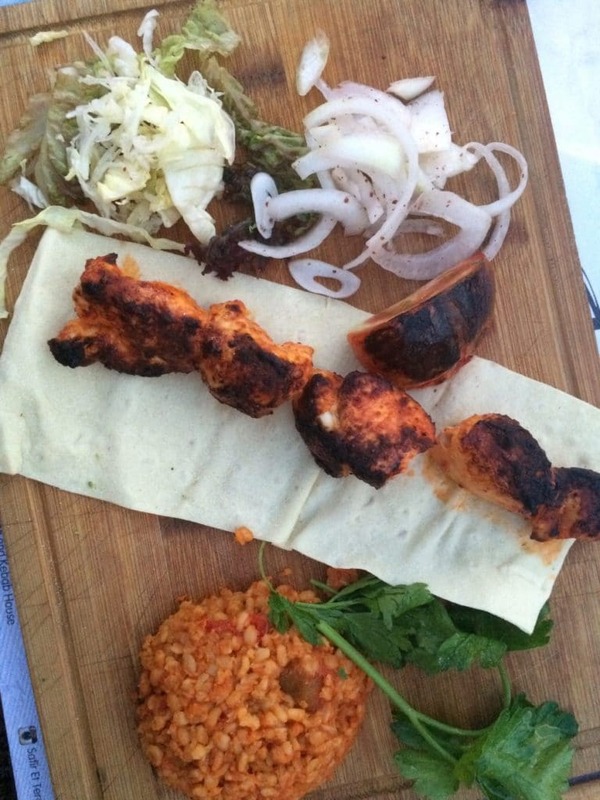 For my entree, I went with a classic: chicken kabob platter. 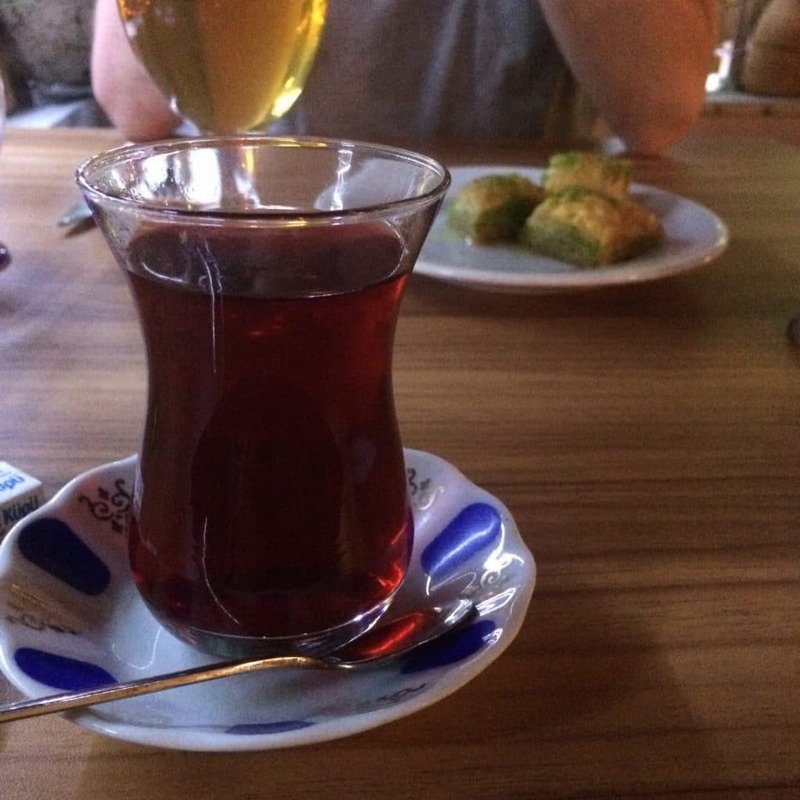 After dinner, Bryan ordered a plate of baklava, and I had a cup of tea (did I mention it’s not decaf? I could have easily reminded you at 3am the next morning. Just sayin’) followed by another round of teas that the waiter gave us while we waited for a quick credit card snafu to get worked out. Part of me wished that the credit card issue hadn’t been worked out and the waiter had been an a-hole, because that would have been it easier to leave. But, sadly, it was quite the opposite. So.. we left Istanbul, against my will and better judgement, and boarded a plane back to London. 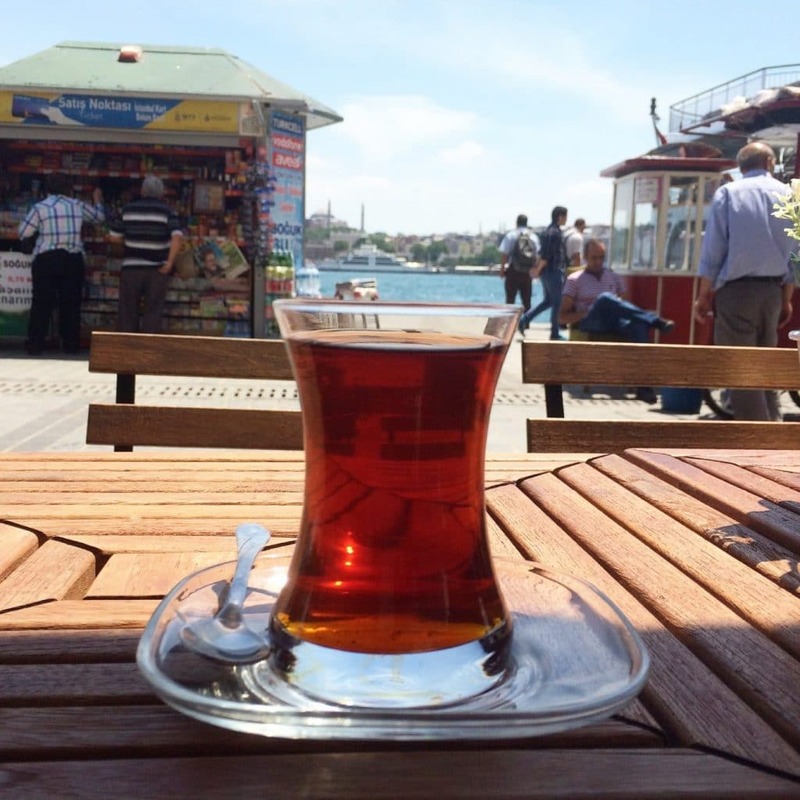 Due to the tea, and maybe subconsciously wanting to soak up every last moment, I don’t think I slept for a single second that last night in Istanbul, so by the time we got to the airport, I was famished. I brought some hard boiled eggs (one of my favorite travel snacks, now more than ever) and the last of the cucumbers, and we also got a fruit cup (it had seen better days), and Bryan got a pastry filled with poppy seeds and some sort of custard or cheese or something (I wasn’t really paying attention). 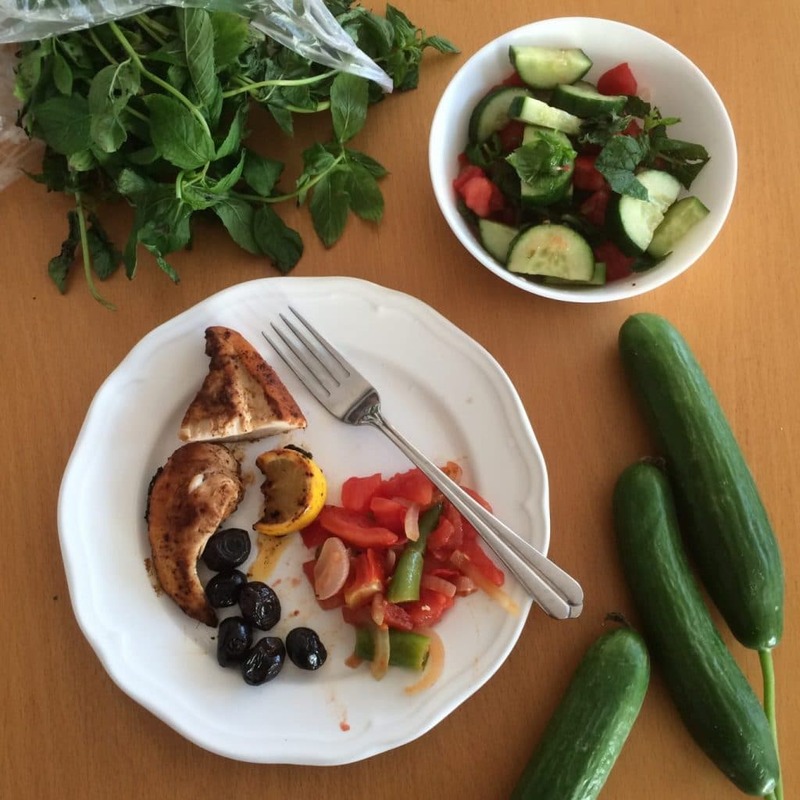 While I didn’t have any trouble eating on this trip no matter where we were, I would say that Turkey was probably the easiest country to eat in because of the heavy emphasis on protein and produce as the base of their cuisine, with starch as a side dish. They also cook more with oil than butter, and when they use dairy it is frequently fermented (Ayran, yogurt and yogurt-based sauces, cheese) which, for me at least, tends to be easier to digest. And, unlike London and Paris, it was cheap. In the latter two cities, we probably could have spent much less on food if we had just stopped for to-go sandwiches at lunch time (obviously not an option), rather than sitting for a full meal made of more expensive ingredients like meat and fresh produce. 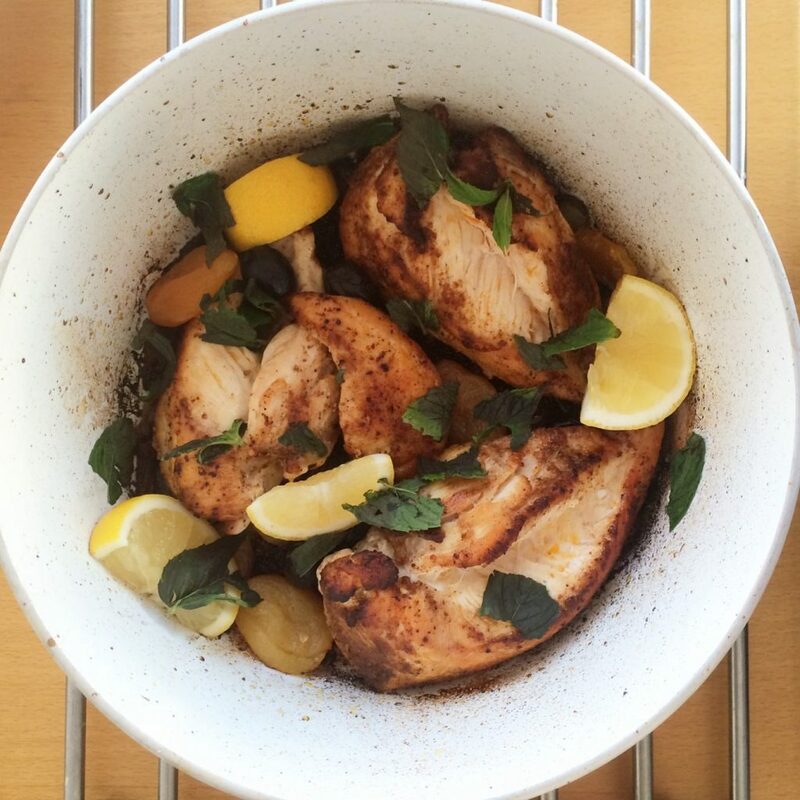 That wasn’t a big deal – we still didn’t break the bank on food, especially since we cooked in our apartments so much, but it is notable if you’re on a budget. So that brings us to the end of our trip! 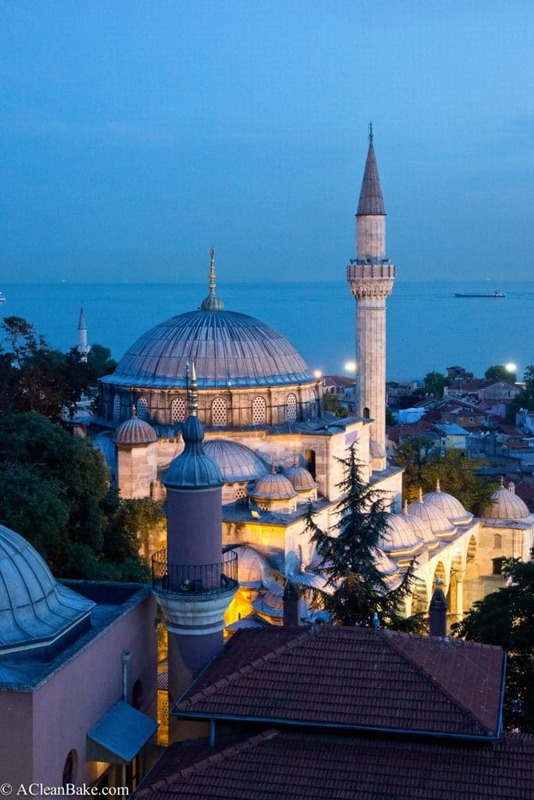 Have you been to London, Paris or Istanbul lately? What was your favorite meal in any of these cities? 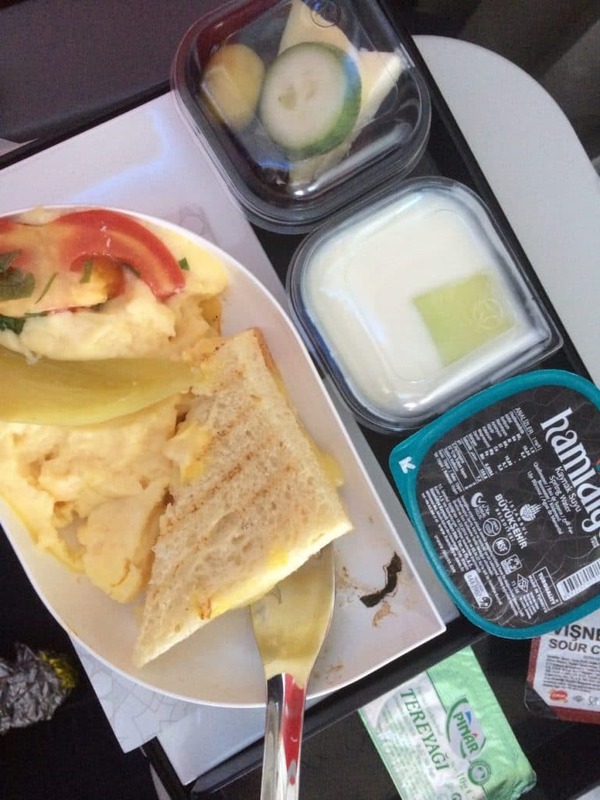 I’m just going to confess that your travel posts have just been making me hungry and ready to jump onto a plane. Too bad I am not allowed this next few weeks. I am seriously drooling like a crazy lady over here! 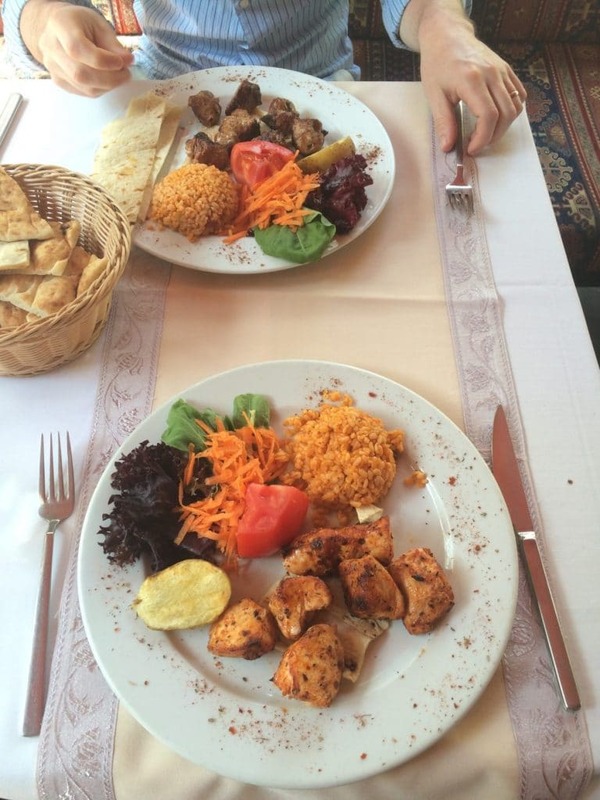 It seems like Istanbul is the perfect place to eat gluten free, especially with all those glorious kebabs! 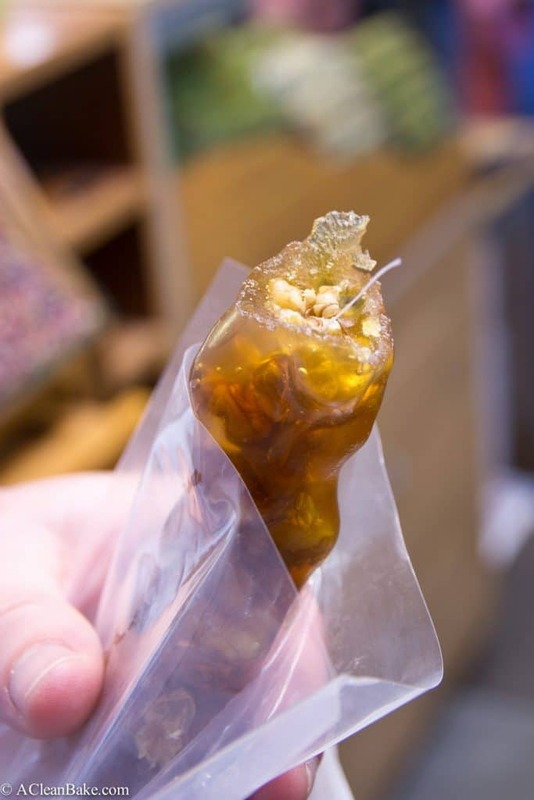 Meat on a stick perfume?? I think that would sell! These photos are gorgeous and it sounds like you had an amazing time.